Exit: Follow Highway 401 to Kingston and exit south on Sir John A. Macdonald Blvd. (exit 615). Follow this street south to Union Street, which is at the eighth set of traffic lights. Turn left onto Union and continue for approximately 10 blocks to the Queen's campus. 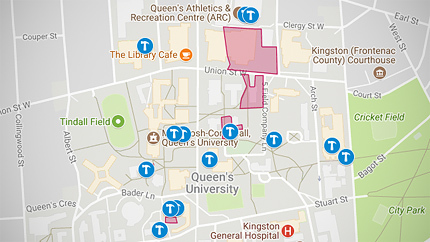 Paid underground parking for visitors to the main campus of Queen's University is available in the parking garage located at the corner of University Avenue and Stuart Street (enter form Stuart Street) as well as the Queen’s Centre parking garage (enter from Division Street). On main campus, there are designated spots areas in the Tindall Field surface lot. The City of Kingston is in charge of, and enforces, metered pay-and-display parking along many streets in the area (e.g., parts of Union Street — including directly in front of Gordon Hall where our guided campus tours begin), Alfred Street, Clergy Street, Stuart Street and more), in the parking lot located at Barrie Street and King Street. Visitors to west campus may park in the pay-and-display area south of McArthur Hall. Limited parking is available to visitors to the Isabel Bader Centre for the Performing Arts. Free parking is also available along some city streets (with time restrictions). Use of permit parking spaces is also allowed after designated hours (see restrictions below). The Queen's campus is about a $15-20 taxi ride from the train station, bus terminal and airport. Allow for 15-20 minutes travel time during peak periods. Some private shuttle services are available from nearby US airports. Finding Kingston, Ontario, Canada: select image for larger view. Find university policies and guidelines on use of cannabis.